Hanoi is a fascinating city with a combination of classic and youthful styles, but if you want to explore the Vietnamese people and their culture, you must delve deep into its street food. For anyone who has been to Hanoi, nom bo kho (green papaya salad with dried beef) is an excellent dish. No one knows where nom bo kho came from or when it first appeared. However, this dish isvery popular with Hanoians and visitors. 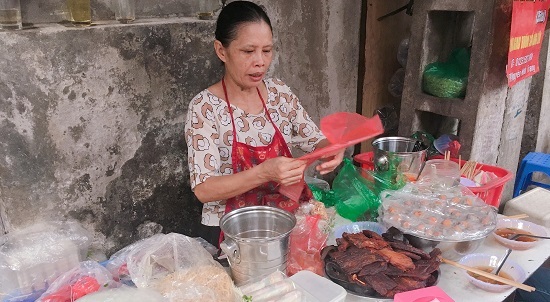 In Hanoi, you can find nom bo kho in many streets or alleys, but beating all of the above is the tiny restaurant in Ham Long street or Thanh Ha alley, O Quan Chuong street. My recommendation for you is nom bo kho Ba Gia in Thanh Ha alley, O Quan Chuong street. The presentation of the dish is quite similar to that in Ham Long street. However, nom bo kho Ba Gia is said to serve the most excellent beef and sauce. Groups of young students and families comfortably sit on plastic stools on sidewalks, and enjoy a fresh salad on small plastic plates. The dish is so good that they don’t mind motorbikes and cars passing by their tables. Vietnamese, especially Hanoi food, is also considered one of the healthiest foods in the world. The use of fresh herbs, meat, and fish sauce combined with a right balance of spices is what makes Hanoi food taste and smell so good. Nom bo kho served on the streets is the best example of the balance, like the name, it combines dried beef, green papaya, peanuts, perilla leaves with mixed fish sauces. Among those ingredients, the salad dressing really stands out. There is no denying that nom bo kho is a popular street snack. A good dish of nom bo kho is strongly influenced by the sauce. If the sauce tastes good, then this dish is even more delicious. Located in Thanh Ha alley, O Quan Chuong street, nom bo kho Ba Gia outlet makes Hanoi’s shortest street always crowded with local and foreign visitors. nom bo kho Ba Gia is open from 3:00 – 6:00 pm. Each plate of nom bo kho costs you VND25,000 (US$1.07). O Quan Chuong is the only remaining gate of the ancient Thang Long citadel. According to historical records, this gate was built in the 10th year of Canh Hung Dynasty (1749), called Dong Ha Mon (Dong Ha gate or the gate of Dong Ha ward). This work was restored twice, in 1804 and 1817, under the reign of King Gia Long. The current architecture is the result of the first repair in 1804. O Quan Chuong was designed as a vong lau - a typical architecture of the Nguyen dynasty, with the front facing O Quan Chuong Street and the back looking to Hang Chieu Street. The gate has two storeys. The first storey has three doors: a door in the middle 3m high and 3m wide, and two side doors about 1.65m wide, 2.5m high.